Family owned father and son team operating independently and unbiased, members of Society of Accredited Marine Surveyors (SAMS®) & ABYC, providing Boat Survey and Inspection Services to the Ft Pierce FL area and nearby communities. We are the experienced team to call when you need a boat or yacht inspection. Our knowledge in both power and sail, includes Trawlers, Sport Fish, Sailboats, Catamarans, Center Consoles and Express Cruisers. Our expertise covers Outboard, Inboard and Diesel Engines with special interests in various hull construction materials and building techniques, using Fiberglass and Composites. If you have a boat, you need one to get insurance. If you have a boat or yacht to buy or sell - you need one for appraisal value or for a pre-purchase inspection. Marine surveys are required by your insurance company before they will insure a boat. A marine survey is a thorough and detailed inspection of a vessel to determine its comprehensive current condition and overall fitness on the day of the inspection. An experienced marine surveyor will look for things that could sink the boat, cause fire, or endanger lives. A marine survey is essential for boat safety and of course boat insurance. A detailed marine survey should cover all mechanical systems in the boat as well as structure and cosmetic condition to determine if the vessel is safe for its intended use to protect your investment. It should include all findings with recommendations and a valuation. This will give you a better idea of exactly what you are buying into when purchasing a vessel. We are experts as pre-purchase yacht and boat consultants. Don't buy a boat without us - we could save you from buying a BIG mistake! If you’re intending to invest several thousand of your hard-earned dollars in purchasing a boat or yacht in Ft Pierce, a marine survey may be the least expensive and most valuable tool you can have to assist you in making the right purchase. We have experience in the industry. Certain types and makes of vessels and pleasure boats can have recurring problems and a good marine surveyor like Hamilton & Hamilton Marine Surveyors will be familiar with these problems and will advise you on the suitability of your intended purchase, its equipment, and particularly in relation to how and where you will be using it. "Very Happy with John's services! He Surveyed my 25 Hydra Sport and was easy to work with, accommodating, Professional, diligent and thorough. Honestly I will recommend him to anyone looking to do a survey." "What a pleasure to work with John. I was looking for a reputable survey company to complete a last minute survey on a boat of a lifetime. Every survey company I called was about a week out. Not only did JOHN come out the next day, but it was a Saturday at that. JOHN is a family man and I know time was taken away from them that day. I will be forever greatful! Throughout the process I asked a plethora of questions (being my first boat purchase) and I never felt as if I was bothering John. Two days later I received a very professional and thorough survey. Which satisfied the loan and insurance company. Thanks again, John! Forever Greatful!" "What a pleasure to work with John. I was looking for a reputable survey company to complete a last minute survey on a boat of a lifetime. Every survey company I called was about a week out. Not only did JOHN come out the next day, but it was a Saturday at that. JOHN is a family man and I know time was taken away from them that day. I will be forever greatful! Throughout the process I asked a plethora of questions (being my first boat purchase) and I never felt as if I was bothering John. Two days later I received a very professional and thorough survey. Which satisfied the loan and insurance company. Thanks again, John! Forever Greatful!" "John recently performed a survey on a 36 Luhrs Convertible my wife and I were interested in purchasing. He was able to identify numerous deficiencies that would have been imperceivable to the average buyer. He provided us a very professional PDF survey document, a list of comparable vessels and an accurate valuation of the vessel. John also recommended a very good engine surveyor that identified a critical deficiency on one of the engines saving us $1000's in repairs. Highly recommend John Hamilton." "Very good experience! John was very professional and timely and even gave me the finished report back prior to when he promised it!!! Very thorough report and would highly recommend him to anyone purchasing a boat. It wont be my last boat and he has earned a customer for life!" "Excellent overall experience. I recently used Hamilton Marine Surveyors for a prepurchase vessel inspection. I did not have a trailer available and John was able to find a place to have the boat removed for proper inspection. John was very professional and knowledgeable." "I had to have a boat surveyed in FL and I live in MD. John made the process extremely easy. He was very informative and responsive. This was my first time having a boat surveyed and I could not have asked for better service. He spent a lot of time with the boat inspecting every last detail. He even coordinated a few other services for me out of good will. I highly recommend him!" Boat Appraisal and Inspections – If you are selling, donating, settling a divorce or estate; or other types of legal matters you may need an Appraisal Survey. This type of inspection should be from a certified marine surveyor and determines the fair market value of the vessel. The vessel is inspected to ascertain its correct market value along with market research for comparables. Pre-Purchase Marine Survey – A pre-purchase vessel survey is one of the most thorough surveys you can have. It provides a prospective boat buyer with detailed documentation to confirm or deny that a vessel is free of operational hazard, sea worthy, appropriately valued, and free of defect or damage. Boat or Yacht Purchase Consulting – To ensure you are buying the right boat for your needs and that you are correctly interpreting a pre-purchase survey from a seller, John Hamilton can be your boat or yacht consultant. His expertise can be the best investment you’ll ever make. Insurance Marine Survey – A Condition & Value Survey (insurance survey) is what your insurance carrier or lender may require you to obtain in order for them to bind or renew coverage, or even to close a loan on your vessel. If you don’t see the boat service you need – just ask! Video Presentation – Can’t view your boat issues in person? We provide videos for prospective boat buyers and owners who can’t be a part of the inspection process in person. This is especially helpful when considering buying a boat or yacht or for legal matters. The detailed video inspection can be very useful in determining if further interest is desired. Sea Trials – Before you buy a boat or yacht, after a repair, or even to diagnose a problem a sea trial is a must. There can be various levels of sea trials as well. The goal of a sea trial is to determine if all systems function normally even when run hard and to do so under conditions, time, and place of your choosing; otherwise, issues can take place when you are least prepared. Yacht Repair Inspection Surveys – Sometimes it takes a trained eye to spot inadequacies in repairs. Some repairs may even require a sea trial. After any kind of boat or yacht repair we can inspect the repair and prepare a report for your insurance or prospective buyers. Damage Inspections – Fire Damage, Towing Damage – When damage occurs it’s impossible to gauge the severity and the extent of the damage by eyesight only. A professional marine damage survey will effectively diagnose which structural components and systems were negatively affected from the damage. Infrared Thermal Imaging/Scanning – This service can be incorporated into marine surveys by revealing abnormal temperature anomalies or moisture readings using a thermographic infrared camera. This is highly beneficial for revealing hidden or visually obscured mechanical equipment malfunctions such as leaks or overheating. Accident and Fraud Investigations – We conduct marine investigations as needed by insurance companies or boat owner clients. We often work with boat owners who are having trouble with insurance claim issues, usually assisting the boat owner to obtain a proper claims settlement. Litigation and Expert Witness Support Services – Our 30+ years of marine experience enables us to be reliable fact witnesses or expert witnesses for dispute claims in federal and state courts. We can provide collection of damage claim evidence, photo or video documentation, and samples for laboratory analysis. Additional Boat Inspection Services – We offer a wide variety of additional marine inspection services such as: Oil samples & Analysis, Moisture meter testing, Corrosion Inspection Analysis, Hull sounding with phenolic hammer, Commissioning services and USCG Safety inspections. John Hamilton has grown up in the Marine Industry. He is an accomplished 100Ton Master, a licensed Able Bodied Seaman, and a Florida Licensed Insurance Adjuster. 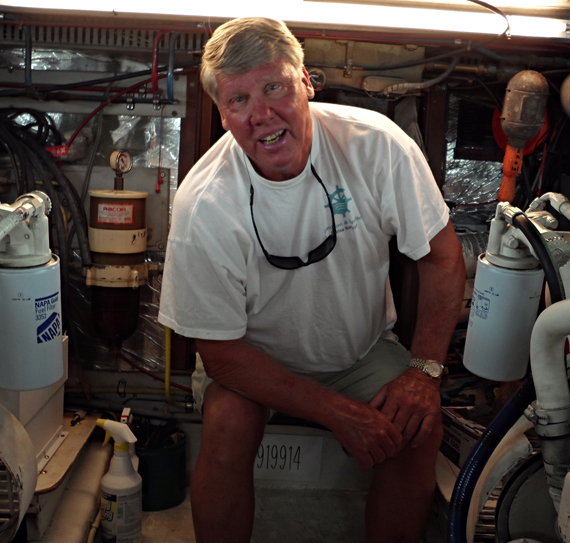 He is a graduate of Chapman’s Yacht & Small Craft Survey School and the Marine Damage Survey and Assessment class, and well respected for his knowledge in small craft repair and maintenance. He is a member in the Society of Accredited Marine Surveyor and an ABYC Certified Marine Technician. He belongs to Boat US and is a PADI Advanced Diver. His hobbies are fishing, spear fishing, SCUBA diving and of course, boating. Stuart Hamilton (Stu) Worked on private yachts and commercial fishing boats throughout his life. He is a US Navy Vietnam Veteran with time on River Patrol Boats and Destroyers. He is a 100Ton Master and was an instructor at Chapman’s School of Seamanship. He owns and maintains a 57’ Nordhavn and a 31” Bertram Bahia Mar. He holds a Florida Insurance Adjuster’s License and is a Graduate of the Chapman Yacht & Small Craft course and the Marine Damage Assessment course. He is a member of the Society of Accredited Marine Surveyors and an ABYC Certified Marine Technician. 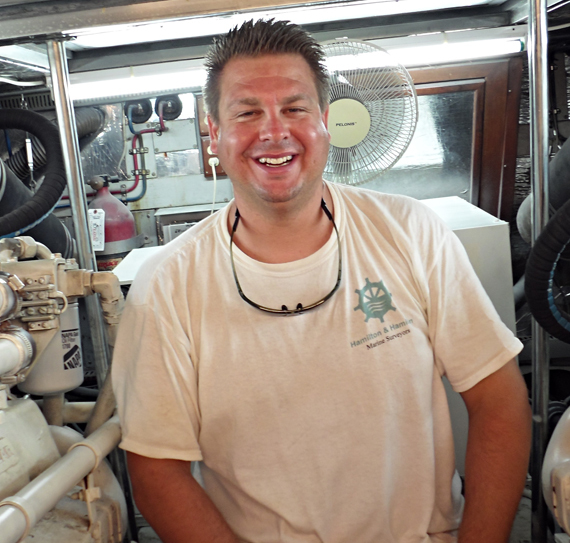 He is also a Vessel Safety Examiner for the St. Lucie River Power Squadron, a PADI Advanced Diver and Boat US Member. Hobbies are boating, SCUBA Diving & Aviation. We hold ourselves to the highest professional and ethical standards. Our surveys are provided to the customer in a SAMS® approved format and are readily acceptable by insurance companies. Our vessel surveys are non-intrusive and we pride ourselves in leaving the vessel the way we found it. Contact us today by calling 772-237-3460 or filling out the contact page form. Thanks for choosing us! Hamilton & Hamilton Marine Surveyors. Why Choose Hamilton Marine Services? We Protect Only Your Interests!